The outdoor edition of Fireside Tales returns (bring marshmallows). 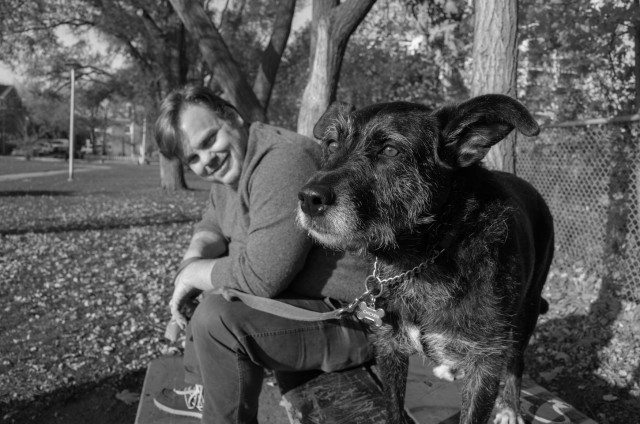 Pat Thornton may bring his dog Chicken to tonight’s Fireside Tales. Photo by Kristan Klimczak. With the return of warmer weather, so goes the return of many things Torontonians enjoy doing outside. There is an inside winter edition of Fireside Tales, but few things beat the deep seated appeal of sitting around a fire outside hearing good stories, and this (free!) show manages to replicate that rustic experience, even in the bustling downtown core. Co-producers and co-hosts Helder Brum and Rhiannon Archer’s guests tonight include Pat Thornton, Dawn Whitwell, and Dan Galea. Tuesday, April 18, Dufferin Grove Park fire pit (875 Dufferin Street), 8 p.m., FREE.